When it comes to your driveway there is nothing we don’t do. All Star is a one stop shop for your driveway. We also perform a wide range of masonry services such as Belgium block curbing and aprons, walkways and retaining walls. New Driveway Installation– On a new driveway installation, we remove any trees and stumps. Then we hog out all the organic material to make room for a substantial amount of process road base. After that, we install 12”-18” of process road base and compact with a large vibratory roller. It’s a good idea to let that base material sit since there was so much of it installed. After it settles it is ready for fine grading and paving. Remove and Replace– A removal and replacement is just that; we remove and dispose of all the existing asphalt. Your existing base material is left in place because there is no reason to remove it. We add road base to fine grade for proper drainage. The road base is the compacted with a large vibratory roller and then it’s ready for asphalt. Asphalt Overlay– Overlaying is when we pave over an existing asphalt surface. To do this, the existing asphalt has to be in somewhat decent condition to start with. The other consideration when performing an overlay is drainage. 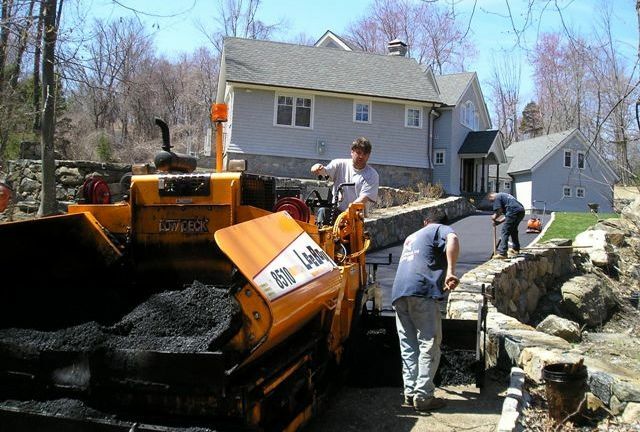 It is difficult if not impossible to change the grade of your driveway with an overlay. Overlaying is viable option in some situations but certain factors need to be taken into consideration. When performing a patch the only way to make it last is to cut it out. We saw cut the perimeter of the area to be patched with a diamond blade saw. Then we remove and dispose of the asphalt. The area is prepared with our ¾” process road base. The base is compacted and then the area is ready to be paved. Properly patched areas will last longer than the rest of your driveway. Our services don’t stop with the installation. We are here for our clients throughout the life of their driveway. Driveway Sealcoating– Seal coating is a preventive measure to ensuring the longevity of your driveway. Seal coating should be done after the driveway has been in for one year. To make sure our clients don’t forget we send an alert via email one year after the driveway is installed. The driveway should be sealed every 3 years after its original seal coating. Crack Filling– Getting on a regiment like this enables us to fill cracks as they appear. This will also extend the life of your driveway. We use hot pour crack filler for crack repair. We have tried every product in the industry but the hot pour still works best. Crack filler will last 2-3 years. It is a rubber based product made to expand and contract with the weather.